Salad vending machines sell healthy food, making it a convenient option for the meals. The time is not far when fresh food will be more accessible than a candy bar. Farmer’s Fridge, a startup company since 2013, sells only the salad ranging from USD 4 to 12, making it reasonable and convenient than going to a salad restaurant. Meals stay fresh for 24 to 48 hours and thereafter it is donated. The ready-to-eat sector has been rising over the past few years with the 10% y-o-y increase in demand. Goldstein Research analyst forecast, the global packaged food vending machines accounts for 18% of the total vending machines and the global snacks and food vending machine has 20% market share of the global vending machines. With the growing demand for the fresh food compared to the packaged food there is an opportunity for salad vending machine to grow at a CAGR of 4.4% and it is set to reach USD 306 million by 2024 from 215.2 million in 2016. The report covers the present ground scenario and the future growth prospects of the salad vending machine market for 2016-2024 along with the import and export data of salad vending machines and installed units worldwide. We calculated the market size and revenue share on the basis of revenue generated from major players and sales of salad vending machine from major players across the globe. On the basis of the type of vending machines, full line machines market has a market share of 63% of the salad vending machines, because of the convenience for the customer to choose the salad and other food products as well from the same machine. On the other hand, single specialized machines are growing at a faster growth rate of 5.2% owing to the customization available from the variety of salads. Salad vending machine market outlook 2016-2024 has been prepared based on an in-depth market analysis from industry experts. 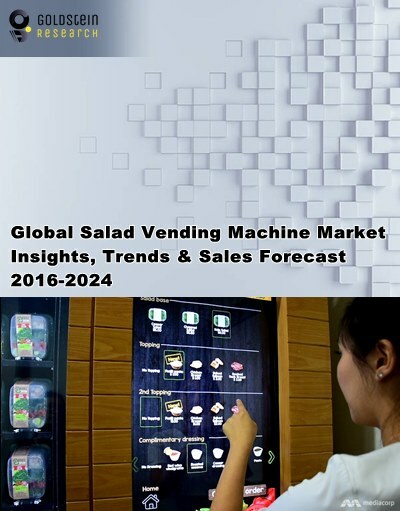 The report covers the competitive landscape and current position of major players in the salad vending machine market. The report also includes Porter's five force model, SWOT analysis, company profiling, business strategies of market players and their business models. Global salad vending machine market report also recognizes value chain analysis to understand the cost differentiation to provide a competitive advantage to the existing and new entry players. With the advancement in technology, there is a trend of robots for food service, offering fresh customized salad within 60 seconds. The robotic machine salad vending machine – Sally manufactured by Chowbotics works like a chef to make the salad from the choices made by the customers out of the suggested or customized recipe available by clicking on a touchscreen. According to the report, major driving factor for the growth of salad vending machine market is the demand for the anytime availability of fresh and healthy food. An American spends USD 1200 on fast food every year. Because of salad vending machines, there is a huge potential to convert fast food expenditure towards the healthy meals. Further, the major challenge for the salad vending machines is the development of robotic machines working as salad vending machines such as Sally the salad robot, a product by Chowbotics Inc. that serves more than 1000 different type of salads, compared to other salad vending machines serving 8-12 types of salads only. Based on geography, North America has the largest market share of salad vending machines owing to the presence of salad vending machine manufacturers and the growing number of healthy food vending machine installations at the rate of 94.1% during the period of 2014-2016. Asia is an opportunistic market for the growth of salad vending machines such as Japan had the largest vending machine sales of USD 38.0 billion in 2016. Japan old age population is highly dependent on the vending machines and in Japan 1 vending machine is available per 24 people. The global salad vending machine market report comprises of the following companies as the key players in the salad vending machine market: Farmer’s Fridge, Chowbotics, Shake Salad, Continental Vending, Bicom. What is the revenue of salad vending machine market in 2015-16 and what would be the expected demand over the forecasted period?